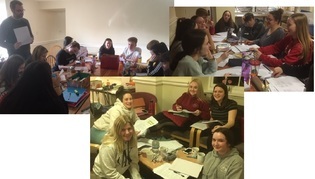 The Scottish Youth Parliament Elections began on the 15th March. The Youth Parliament was set up to act as the voice of young people in Scotland. It offers young people aged between 14 and 25 the opportunity to get involved in the decision-making processes in Scotland and the UK. All of our young people had the opportunity to vote within their Health and Wellbeing classes. There are three candidates within the Cumbernauld and Kilsyth Constituencies. Our 4th year pupil Philip Orifij has been elected by the Scottish Youth Parliament in representing Cumbernauld and Kilsyth area. Huge congratulations to Philip ! Pupils from the Singing Group and Ceilidh Band spent an afternoon entertaining residents at Larch Grove Sheltered Housing in Abronhill. The pupils had a fantastic time and really enjoyed meeting members of the community. The residents at Larch Grove loved their musical afternoon and have asked our pupils to return again soon. 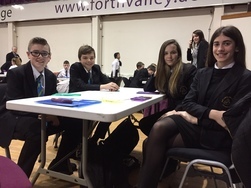 Our Junior Team took part in the UKMT Mathematics Team Challenge Regional Finals on Tuesday 19 March at Forth Valley College, Falkirk. The team were Aimee Griffen (S1), Laura Hubbard-Perez (S2), Aidan McAteer (S1) and Millar McGroarty (S2). Allanah Littlejohns (S3) recently competed in the UDO British Street Dance Championships. Allanah’s crew achieved 4th place and Allanah was placed 7th for her solo perfromance, whilst also becoming the under 16s British House Battles Champion. 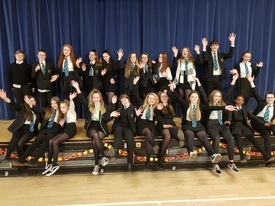 To celebrate World Book Day on March 7th, a number of S6 pupils planned a number of creative and enjoyable activities for both staff and pupils. 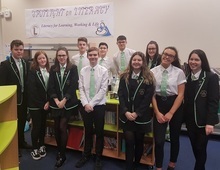 As part of their Personal Development course award, pupil created displays organised quizzes and hosted a World Book Day Coffee Morning. As well as this S6 pupils also had a helping hand in encouraging staff to come dressed up their favourite character from literature. 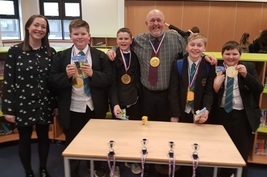 It was fun week, topped off by celebrating 1S1 who were crowned World Book Day Quiz champions alongside Mr Hughes their team captain. 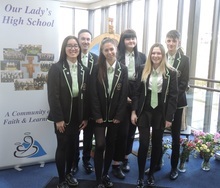 6 of our senior pupils represented Our Lady’s at North Lanarkshire’s Senior Student Leaders’ Conference in Motherwell Concert Hall on Tuesday 26 February. 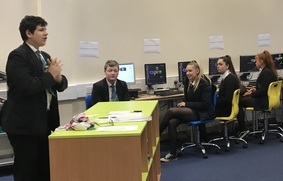 This was a fantastic opportunity for our pupils to contribute to discussions on current issues in education, give their views on initiatives and suggest further leadership opportunities. We were represented by Niamh Boyle, Jacob Brown, Vanessa Liu, Grant Rafferty, Katie Smith and Eva Wynn. 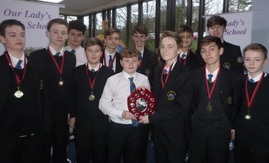 Our S2/3 basketball team were crowned league winners last week after winning all six games in the NLC basketball league. There were three rounds of fixtures in October, January and March. 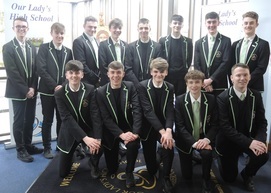 Congratulations to the boys involved: Harvey Boyd, Jacob Charles, Nicholas Colella, Michael Coyle, Luke Cunningham, Kieran Dunsmore, Rogan Kennedy, Sean Lewis, Adam McMenemy, Alastair O’Hara, Alex Peters, Charlie Phillips and Ryan Porter. The Under 18’s football team successfully knocked strong favourites St. Ambrose out of the Hannah Cup. The boys battled hard to gain a 2-2 draw, before winning 5-4 on penalties. A hard fought game in wintery conditions, was almost abandoned ten minutes before the final whistle due to heavy snow fall. 2 goals and a man-of-the-match performance from Sam McNee saw Our Lady’s make it to penalties. Michael Breslin held his nerve to score the 5th penalty to win the tie, after Sean McBride saved superbly. Unfortunately, the boys were knocked out in the quarter finals away to Cardinal Newman in a tightly contested 5-3 loss. They picked themselves back up to comfortably defeat Cumbernauld Academy 5-1 in the league with goals coming from Lewis Wilson, Daniel Drew, Matthew Doogan, Andrew Toner and Kern Marks. The boys had another victory last night with a resounding 3-0 win over Airdrie Academy. Goals scored by Ricco McCreery, Sam McNee and Kern Marks and the Man of the Match was Andrew Toner. 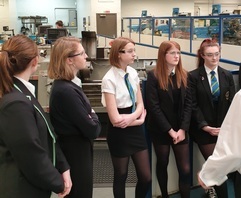 As part of Scottish Apprenticeship Week 2019 and to tie in with International Women’s Day, 2019, the East Kilbride Group Training Association (EKGTA) had invited young women with an interest in traditionally male dominated industries to come and find out more about opportunities in engineering and manufacturing. As part of our school’s commitment to Developing the Young Workforce, Rosie Boyce, Tea Boyd, Louisa Gibson, Rachel Reilly and Emma McCurrach accompanied Mr. Maxwell to the training centre in East Kilbride on Thursday 7th of March. The pupils had expressed a potential interest in a career in engineering and manufacture. They conducted themselves in an excellent fashion and were able to find out more about career pathways in their chosen field.